Lettercase's Prenatal Screening and Testing for Chromosome Conditions webpage offers a good introduction to the different prenatal testing choices. Brighter Tomorrows provides families with balanced and accurate information about receiving a diagnosis of Down syndrome either during pregnancy or at birth. The site has easy navigation to questions and answers, life glimpses, resources, and open letters from moms who have been there. This site provides a full Spanish version as well. The National Down Syndrome Congress has a webpage devoted to new and expectant parents. It includes sections entitled: Fast Facts About Down Syndrome, Expectant Parent's Guide, New Parent's Guide and Parent Resources. The Family Health Line is a statewide free hotline offering counseling information and referrals about pregnancy, infant and toddler issues. The goal of the hotline is to improve the health status of Florida’s pregnant women and their children by providing callers with information on helpful community resources and answering basic questions about pregnancy, breastfeeding, childbirth education and other pregnancy-related concerns. You can reach the Family Health Line at 1-800-451-2229. It is available Monday - Friday from 8:00 a.m. to 11:00 p.m. and 10:30 a.m. to 6:30 p.m. on weekends (closed on state holidays). Counselors are available that speak English, Spanish and Haitian Creole. Florida's Early Steps Directory provides statewide information and referral services for families of children who have disabilities, special health care needs, and developmental delays. 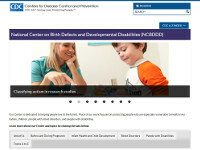 The National Center for Birth Defects and Developmental Disabilities provides clinical information about a diagnosis, including descriptions, risk factors, signs and symptoms; screenings and diagnosis; data and statistics; research and tracking; and related articles. The information is organized in easily searchable categories.